This impressive dark horse sprints out of the starting gate with an audio profile that offers hefty bass and a decent soundstage with a significant emphasis on gaming. The addition of a retractable mike and ultra-lush padding makes it a delightful addition to any gamer’s arsenal. 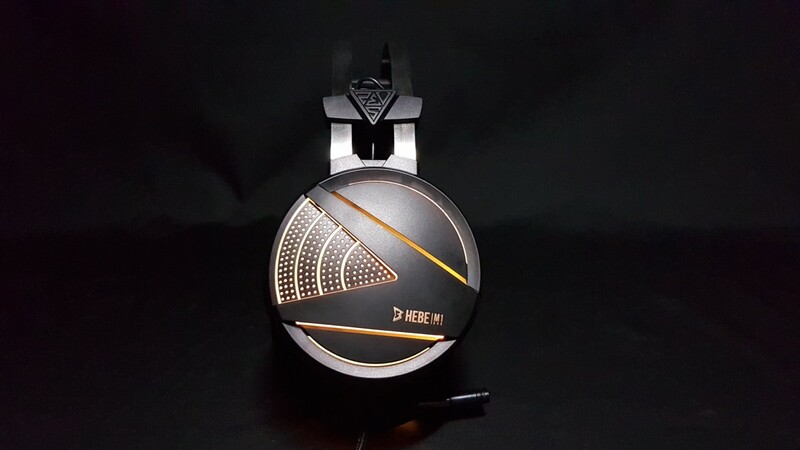 If you’re a gamer looking to get that slight extra experiential edge when you’re racking up your killscore in your next Counterstrike or League of Legends match, you will appreciate the charms that Gamdias’ Hebe M1 RGB on-ear gaming headsets have to offer. 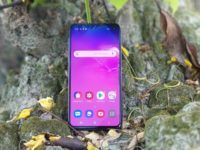 They come in the only colour that you’ll ever need: black though their integrated neon backlighting means you’re able to enjoy a near psychedelic array of different hues when they are in use. 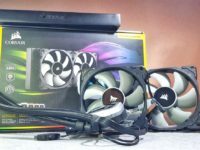 The packaging is fairly simplistic and consists of the headphones themselves sealed within a form-fitting plastic clamshell along with a cardboard box to prevent untoward damage during shipping. 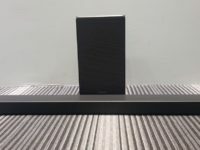 When removed, the Gamdias Hebe M1 is an impressively hefty affair with a weight and feel that’s significantly heavier than many headphones of its ilk and it’s for a good reason. Somewhat akin to its sibling the Hebe E1, the M1 trades in the 3.5mm audio cable of the E1 for larger 50mm drivers, a dedicated USB cable/port and hefty vibration drivers that activate in sync with gaming events onscreen to literally rock your ears off. All this extra hardware comes with a commensurately heavier weight though the exceptional upholstery of the headphones means this is barely felt at all when worn. The whole affair is constructed around a semi-flexible aluminium headpiece that is, alas, non adjustable. Each can also lacks hinges so the overall design of the Hebe M1 lacks some amount of adaptability for differently sized heads. While detractors may immediately raise their hackles at this, it’s not that big of an issue here, so to speak as most of the weight of the headphones is borne not by the frame or the hinges but by a flexible, plushly upholstered headband suspended just beneath the headpiece. 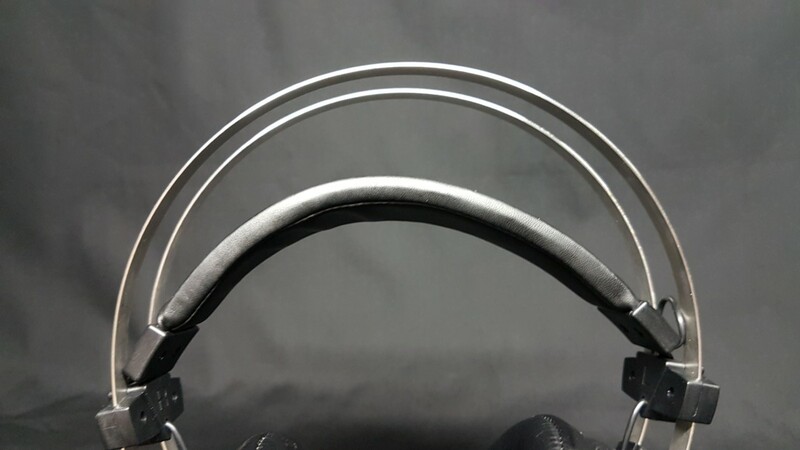 This flexible semi-elastic headpiece bears most of the weight of the headphone when donned, with the rest taken up by the immensely comfortable cans. 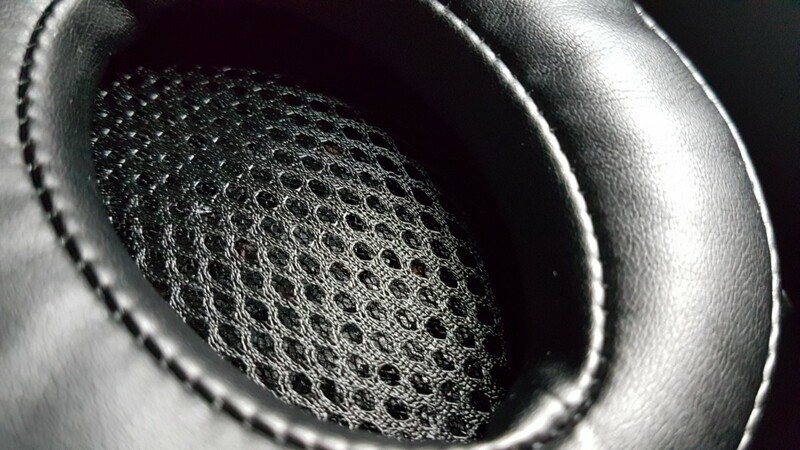 Each can on the Hebe M1 comes with cushioned leatherette upholstery that is almost an inch thick that offer a modicum of sound suppression and exceptional comfort. Each can also has a 50mm neodymium magnet driver paired with 30mm vibration units. The outer edges come with Gamdias’ Hebe logo as well as a cut-out translucent plastic panel that integrates RBG backlighting that changes through the colour spectrum as you game. There are some subtle differences between the left and right can with the left one having a few extra additions to the design. The left one notably comes with a retractable mike that you have can pull out and push back on demand. It also has a non-removable cable terminating in a USB port that is about 2 metres in length. 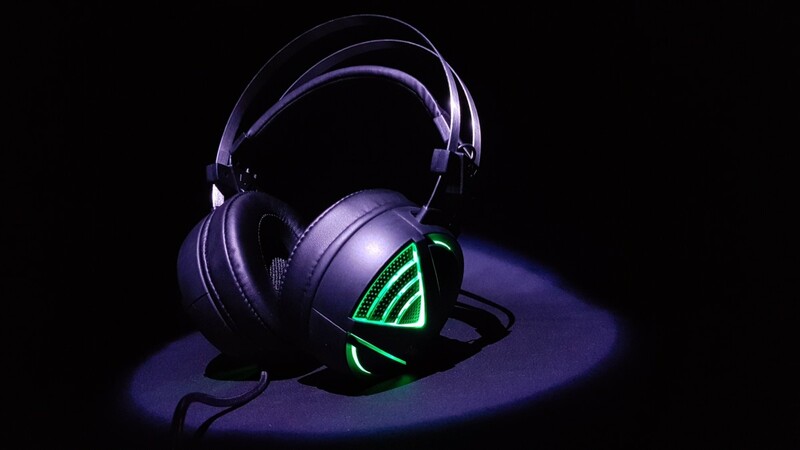 Midway down, the cable has a remote line-in control that comes with buttons to turn the neon backlighting on or off, toggle the mike, control the vibration effect on the headphones and, of course, the volume. Each cable is robustly built and further sheathed in heavy gauge plastic to prevent wear and tear. The USB plug itself has also been lavished with a thin gold-plated veneer for better connectivity. 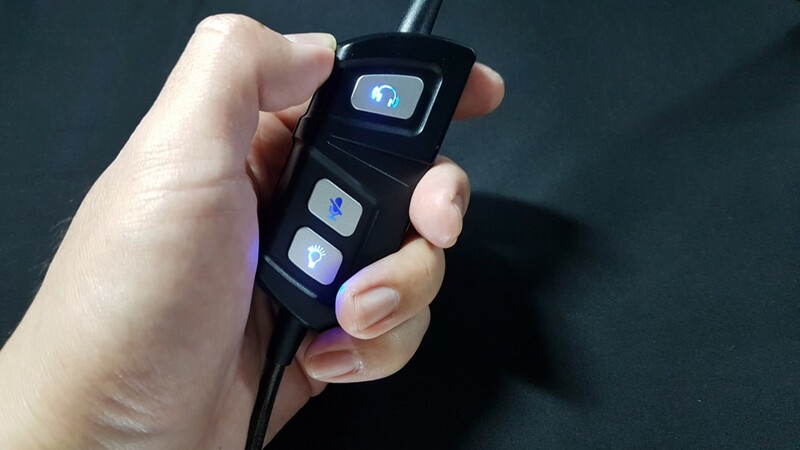 Unfortunately, the permanently connected nature of the USB cable and the lack of wireless connectivity as well as a 3.5mm jack on the Hebe M1 means that it is primarily designed for PC gaming. After testing with several colleagues, one of whom which had the privilege of having a rather large bonce over the rest in the team, the Hebe M1 proved to be ridiculously comfortable even after several hours of wear. Getting the Hebe M1 is up and running is elementary and is simply a matter of plugging it into a PC’s USB port. The colours on the Hebe M1’s side panels cycle through the colour spectrum as you game though you unfortunately cannot control the frequency or colour cycling as it runs through all the colours of the rainbow. You can however turn it off via the in-line controls. 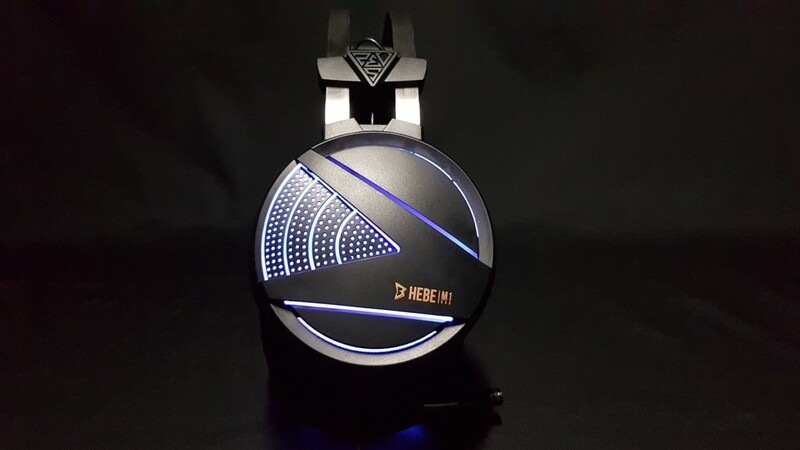 When put to the test across a variety of games as well as movies and a spot of music, the Hebe M1 shined especially well on the gaming front. The directional audio projected by the Hebe M1 was spot-on and it helped to rack up quite a few kills on several FPS games including Black Ops and Team Fortress 2. When it came to bass-heavy games, the Hebe M1 did exceptionally well with a basso in-ear roar when firing off smallarms and a meaty thunk when you connect with a target. In Deus Ex: Human Revolution the subtle aural cues and environmental sounds along with the understated music were rendered with excellent clarity. 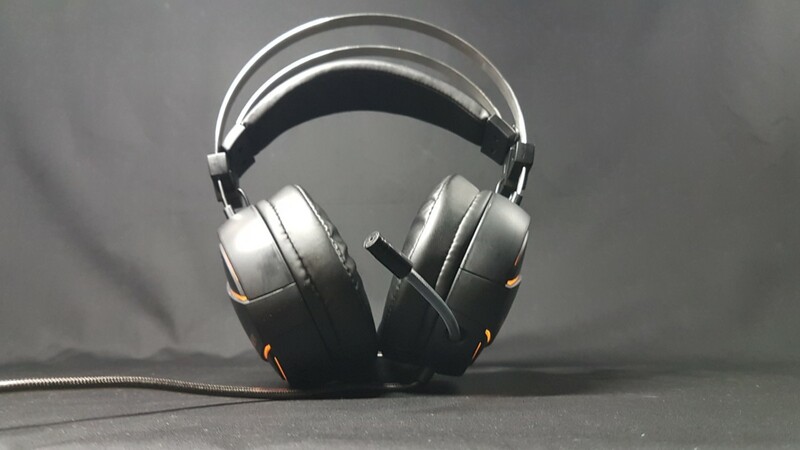 The vibration function is a nifty addition, adding a significant aural kick to every action-packed moment onscreen as well as a visceral oomph when shots or a blow connects though it occasionally detracts from a gaming experience especially when you need to remain focused. Fortunately, this too can be disabled via the aforementioned controls. In movies, it served up a decent soundstage along with commensurately robust bass. Needless to say, films heavy on dialogue fare less well compared to something with a lot of action. In music, it fared moderately well and did best with mainstream music like pop and the like. If you download Gamdias’ Hera software, you can tweak the audio signature of the Hebe M1 somewhat via a series of sliders to suit your needs. It’s a subtle but welcome addition to the headphone but the lack of means to affect the colour cycling is rather vexing though you can disable it too. The built-in mike did not disappoint with good audio clarity on both sides of the divide. Calls on Skype and in-game were audible without significant issues. The retractable nature of the mike also means that it stays securely out of the way rather than flopping around like flip-down mikes in other designs and the stiff cable ensures it remains in position when deployed. 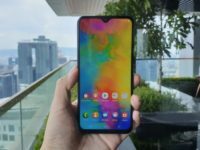 Unfortunately, the Hebe M1’s emphasis on gaming is an interest conundrum. It does exceptionally well in its chosen arena and merely adequately in others. 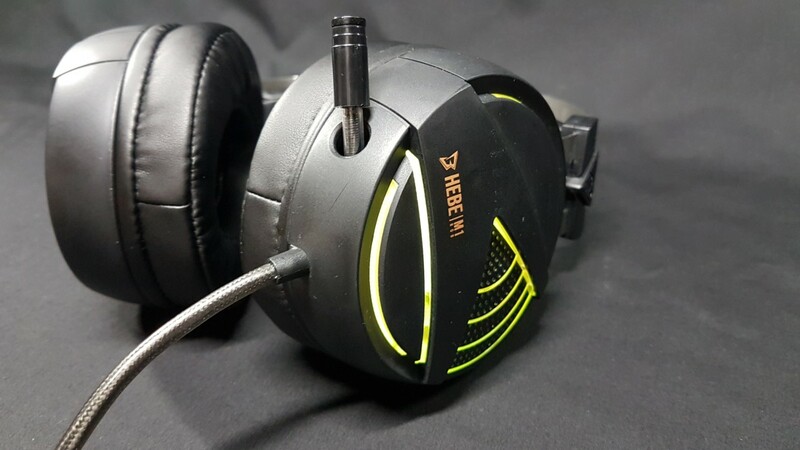 The Hebe M1’s pinpoint-focused focused emphasis on gaming means that it is an easy recommendation for those seeking a headset purely for gaming duties though those seeking a more versatile pair of cans will likely be left less than chuffed. 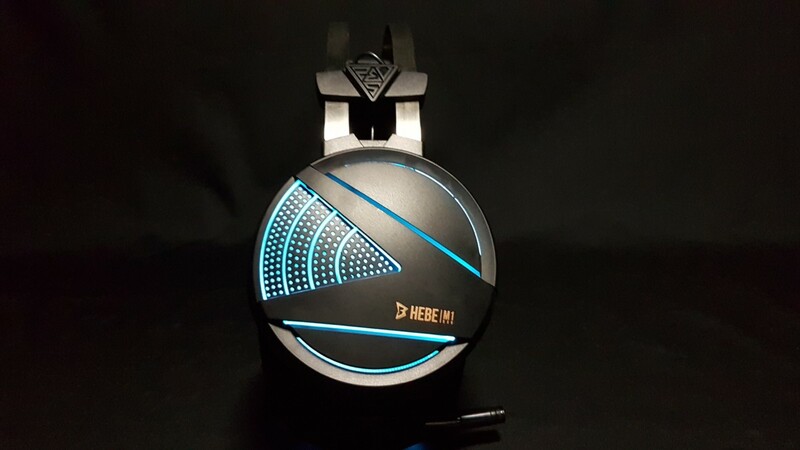 Still, those seeking a more versatile pair of cans can still look up its sibling the Hebe E1. 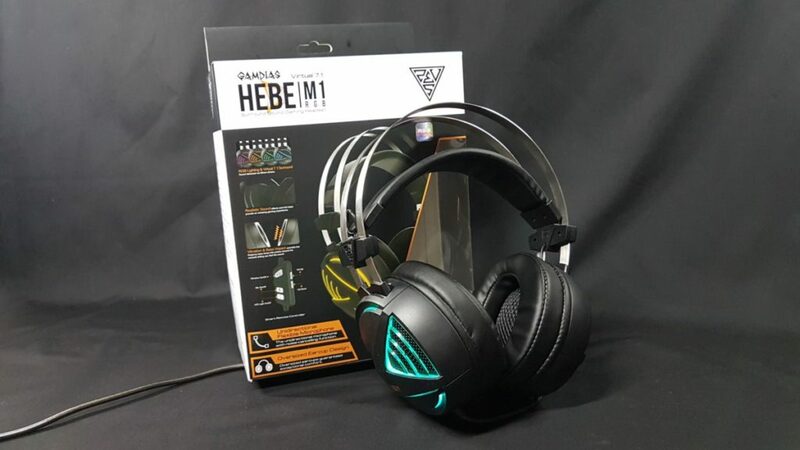 If you’re keen to score a high performing pair of cans specifically for gaming, the Gamdias Hebe M1 won’t let you down. WHAT WE SAY This impressive dark horse sprints out of the starting gate with an audio profile that offers hefty bass and a decent soundstage with a significant emphasis on gaming. The addition of a retractable mike and ultra-lush padding makes it a delightful addition to any gamer’s arsenal.